Mexico is a big country, roughly a quarter the size of the Lower 48 in land area. It includes the Baja California peninsula, extending nearly 800 miles south of the U.S. border. Much of Northern Mexico lies within the arid Chihuahuan desert, with geography similar to west Texas and southern New Mexico. El Potrero Chico is located in the north-eastern state of Nuevo León, about 25 miles northwest of the city of Monterrey (population: 3 million). The Potrero is a sport climbing paradise, with limestone routes up to 20 pitches in length. Mexico is also home to several dozen volcanoes, both extinct and active. At 5,700m (18,701 ft), Pico de Orizaba is the highest peak in the country. Close behind are Popocatépetl "Popo" at 5,452m (17,887 ft) and Iztaccíhuatl "Ixta" at 5,286m (17,342 ft). All three are popular destinations for mountaineers in training for the bigger ranges. Refer to areas for specific directions. here you go! there are some links from people talking about their experience at potrero at this time.... come and enjoy it as always! Flying back to the states, do not put ropes or cams into your carry-on. You will get turned around and will have to pack them into your luggage. Hello administrator here's a link for a website that has a lot of info of climbing areas in the Jalisco area. 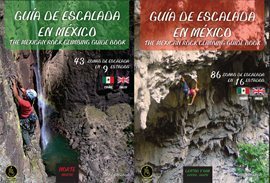 All the information to climb all around MEXICO. 130 climbing areas (sport, trad, multipitch, boulder, dws).